Description: Brfore it became the 24Z TV-204 rolls by the Jct with two Ex CR's. Title: WB NS 211 @ 0947 hrs. 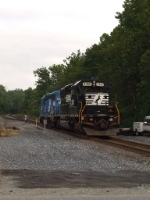 Description: Former Conrail units takes local on the Washington Sec at CP PHILLIPSBURG. Ex-CR #8207 leads ex-CR #6447 @ 1027h. Description: A pair of EMD's heading east at 4:09PM. Description: The 3020 heads east past milepost LB 92 in Catasauqua at 4:25PM. Description: Going away and passing through CP-Caty. Description: Unfortunately she has been repainted. Description: An eastbound Air Products dimensional train heading east on track one at 2:46PM. Title: NS 3435 052 Dementional Extra. Description: Ex Conrail SD40-2 teams with a GP59 eastbound on the high line with NS yard transfer job H5A. Description: Rolling westbound at the NTC is local H3A with cars from the PECO siding to go to Abrams Yard. Description: M9G passes through with a rather good engine set.